Its Dom's Birthday today and he is a bass player in the awesome band Jack Rabbit. Here is Dom with his red guitar and his amp, its exactly how I imagine him to look at one of his gigs. 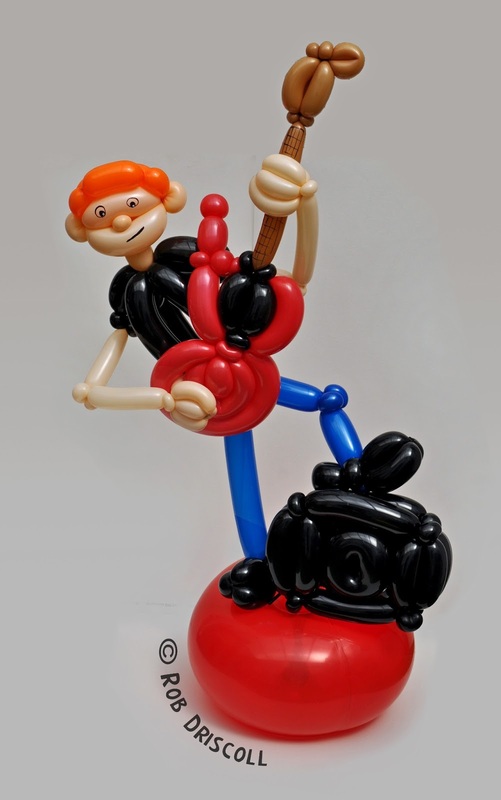 Balloon Dom is made from 23 balloons, for some reason I started with the guitar with is made from 4 x 260s and a 160, it is modelled that on Dom's own guitar, I then made a body and sleeves from 2 x 260s and the arms from 2 x 160s, now I joined the arms and guitar together. The next thing I made were the legs and feet from 3 x 260 and I gave him a belt too from a 160, the amp is made 6 balloons, mostly 260s with a black round balloon for the speaker. The last thing for me to make was Dom's head, it is made from 1 blush 260 and an orange 260 for his ginger hair. I attached the whole thing to a donut balloon so he can stand up nicely. Happy birthday Dom, hope you have a wicked day today. You can keep up to date with all the latest news and sculptures by heading over to Facebook -www.facebook.com/mydailyballoon and hitting the 'like' button.